After the overwhelmingly enthusiastic response to our inaugural event last year, we’re gearing up for our for the Pardes Winter Learning Intensive 2020! Stay tuned for the new theme. Immerse yourself in a week of text-based Jewish learning alongside our dynamic, international 2019-20 Pardes student community. Delve into Biblical, Rabbinic and Modern Jewish conversations more with our inspiring faculty. Guest speakers and site visits. Geared towards students and young professionals of all Jewish backgrounds and learning levels. What is our responsibility towards others – from a moral, spiritual and legal standpoint? What are the power structures that govern our lives and communities? How do our particular identities impact the ways in which we seek social change or adapt to social norms? Download this podcast of Yiscah Smith’s lecture on Developing Sacred Chutzpah, and sample what was learned during the week! 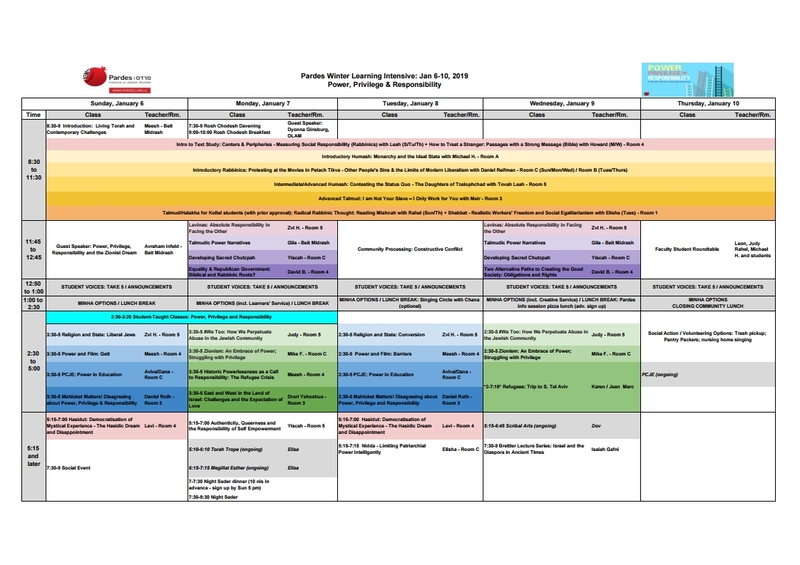 Download Winter Intensive 2019 Schedule as well as the Course Descriptions for the week of learning! This program is open to students and young professionals of all Jewish backgrounds. No previous experience with Jewish text study is necessary, and classes will be offered at a range of levels. Discussions will be conducted in English; texts will be presented in the original Hebrew and Aramaic, with English translations. A non-refundable deposit of $50 must be submitted at the time of the application. Cost includes a festive Rosh Chodesh Community Breakfast on Monday, Jan 7, and a wholesome Community Lunch on Thursday, Jan 10. Tuition for this program is highly subsidized; as such no additional financial aid is available. Applicants are encouraged to seek support from personal and professional development funds available through their communities, workplaces or campus Hillels. For students paying the subsidized tuition+housing rate, Pardes will arrange local housing in a vacation rental facility alongside other program participants. This facility will be within walking distance of Pardes for the nights of Sunday, Jan 6 – Wednesday, Jan 9. We will be in touch several weeks before the program to discuss your needs and preferences. Alternatively, students paying for tuition only may find their own arrangements; Pardes will share a list of helpful resources with participants upon acceptance to the program. Please note that the balance of tuition + housing to be paid by November 28. The registration deadline of November 15th has passed. While we can no longer guarantee housing arrangements, limited spots remain for those who wish to register for the Intensive. Be in touch or apply today! Those who have applied by Nov 15 and want housing need to pay their full balance by November 28 so we can guarantee appropriate housing.